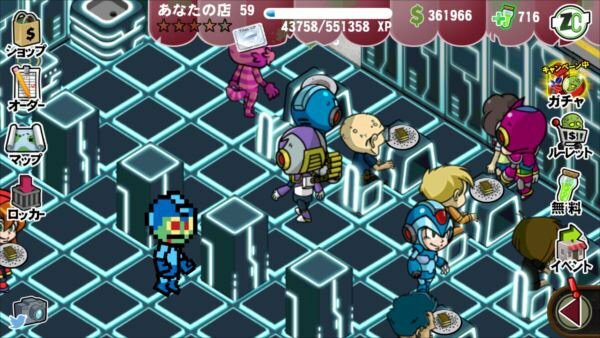 Zombie Cafe, Capcom's popular free-to-play mobile romp, is crossing over with Mega Man X. Starting today, players can serve food to X, Zero, Sigma, Iris, Vile and.... Mac! Yes; someone actually remembered Mac! 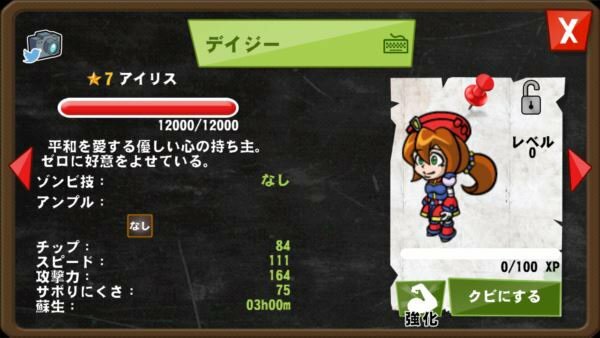 Players can challenge the event cafe, with a chance to obtain Mac (strength 1-3, with higher chance to obtain him in higher difficulty) and Iris (strength 4 only). Players can also challenge weak birds and get one of them. Each bird gives a lot of exp when fed to your zombies. The one in the screenshots, players send up to 6 zombies to fight to the death (unlike the current half that uses current HP, zombies always have full HP in the start of each battle). Points are based on the difficulty, so the higher the more you receive. Just don't chew more brains than you can eat, as going hard and losing may not grant as many points as going easy and getting a flawless victory. Depending of performance, newcomers will probably be able to get only 1 of the characters. X (normal) and Zero are gacha only characters. Each gacha requires 30 Toxins. For 300 Toxins players can get 11 (10 + 1 free) random zombies. Mets only appear as enemies. 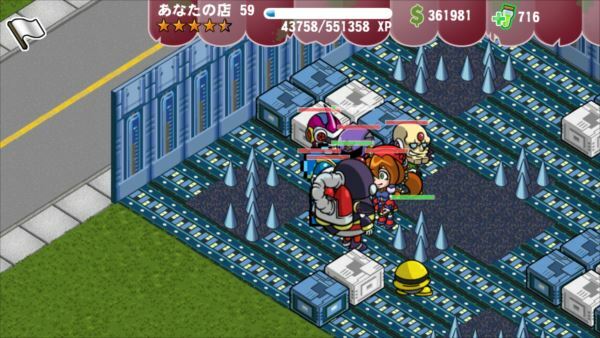 -Events and gacha only become available when the player reaches level 8. -You can't enter an event battle if your Meat Locker is full. Either fed the zombies to others to enhance their strength, or fire them. Though Zombie Cafe is available internationally on Android and iOS, this crossover promotion is currently exclusive to the Japanese version. The event ends May 9th. UPDATE: Added event details (thanks, Event Man) and more screens. 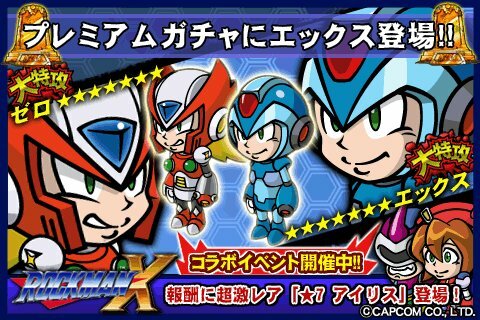 OK, why X and Zero are so "MHX" style, but Mega Man is still in a "old-8bit" style? Because there was a classic Rockman event before in 2014, and Capcom decided to add an 8-bit Rockman to the mix like they did in the Ghosts 'n Goblins event. By the way, according to the official site, newcomers that complete the tutorial (reach level 3) during the event will receive Dr. Wily as a bonus. Wily was very hard to obtain in the 2014 event, and he is quite strong! To be honest, I just don't understand any of Capcom's Mega Man-related decisions anymore. First we get sunglasses, and then we get this out of place cameo in an obscure mobile game? I would really like to see Capcom's current business roadmap for the Mega Man IP...assuming they have one. You can also get Mac on difficulty 4, but man is it tough! I'm yet to get Iris and above half of my team is down after three tries! I wonder what I should take with the points I gathered in part 2. 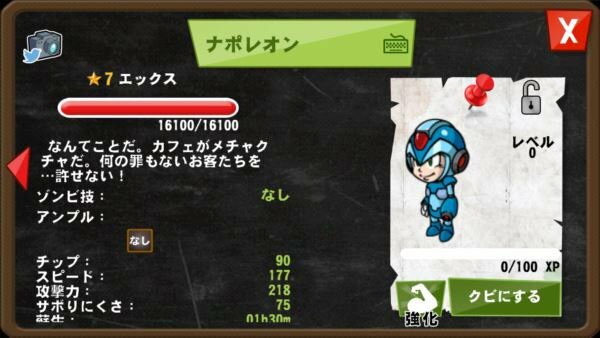 Those include 3 Mega Man recipes (300P-500P each), Sniper Joe (1000P), Cutman (3000P), Airman (6000P), Dr. Wily (12000P), zombie Dot Rockman (14000P), chef Dot Rockman (7000P), Rush (6000P for a decoration without effects? ), and other stuff (Toxins, money, Hatos, Ampoules). Gotta decide before it closes on May 9. Players gain a free gacha try during the final part, so with luck you may get X, Zero, Zombie X, or X (Full Armor). Worst case scenario you get a 5 stars zombie (like unlucky me...). Either way it will be useful for beginners as those zombies are stronger than the ones that appear in the cafe. Later you can try again for 30 Toxin. You can gather 30 during the current event, so you either try your luck again (also getting other strong zombie to help) or use them on continues (6 toxin each) in later stages and try your luck on getting Sigma (not recommended if your 6 strongest zombies are below lv. 30). If you live in Japan, you can use real money to buy Zombie X. He will only be available for a limited time. You could also buy Dr. Right and Roll during part 2. You can also get free Toxin like the USA version by doing tasks. While in the USA you can gain 1 Toxin for every 10 ads you watch, in the Japanese you can install apps to get several toxins. Note that many require more than just installing the app, you need to do stuff like register on the app, and in games you need to complete tutorials or reach level X. The final part is also a survival like part 2, but instead of gathering points in 5 difficulties of your choice, you proceed on levels 1 to 31, each with increased difficulty. Enemies don't recover in this event, so even if you lose, next try they will have the HP they had. Early levels are a breeze, but later you WILL need multiple tries to complete them. There is a pause at Level 16 so players can gather recipes, Levels 17 onward being unlocked later. Here you can get VAVA at lv. 15 and Sigma at lv. 30. After completing level 21 you have a small random chance to gain Iris or Dot Rockman at the end of a level. If you complete Lv. 15 before May 4 you get VAVA with Lv. 20, otherwise he will have the default starting level. There is also a mystery zombie that can only be obtained randomly at the final level. Chill Penguin appears as an enemy, and the Mets have their appearance from the X series. At least the artwork is cute. 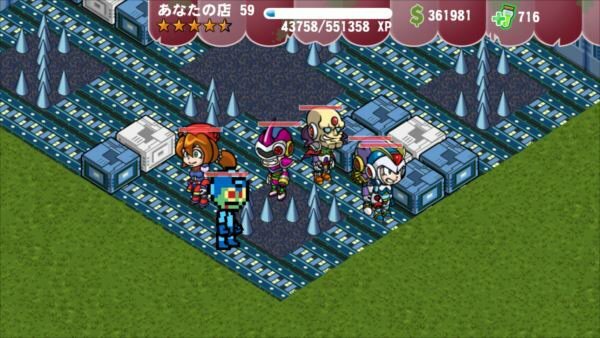 I find it funny and sad that we see Classic Mega Man as a zombie. Ooh! I want someone to rip the met sprites!